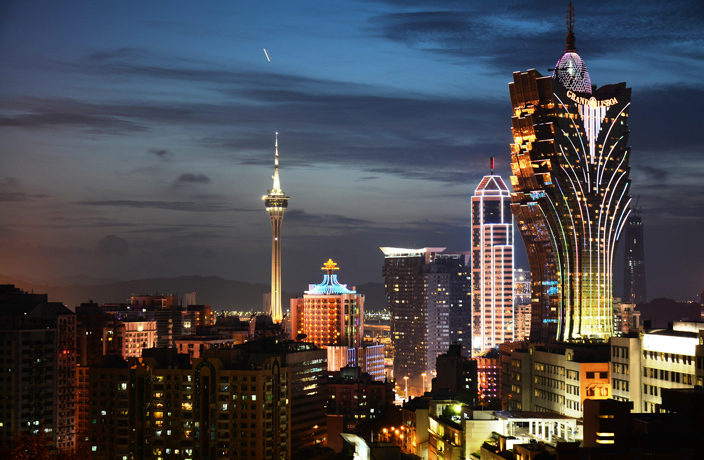 Macau, resting alongside rapidly growing Zhuhai, covers an area of just 30.5 kilometers but boasts some of Asia’s most exquisite foods. The former Portuguese colony, located on the western bank of the Pearl River Delta, was named a UNESCO Creative City of Gastronomy in 2017 for its diverse Macanese ‘fusion’ cuisine, making the island the third city in Greater China to receive the distinguished title (Sichuan’s Chengdu and Guangdong’s Shunde are the other two cities). With this being said, it’s no surprise that many of the world’s most celebrated restaurants have opened shop in Macau. Operating as the casino capital of the East, as well as a burgeoning cultural and arts destination, it’s only fitting that Macau’s dining is up to par. Below, in no particular order, we give you a look into some of our favorite eateries, ranging from rich Italian cuisine to time-honored Chinese dishes, operating on this slice of paradise. Walking through the regal entranceway of Terrazza, which is elegantly accented with creative art, it’s immediately clear what kind of dining experience will unfold inside. Located in a well-designed, inviting and open space, with an intimate outdoor dining area, Terrazza is more than meets the eye. This fashionable restaurant has a great mix of authentic Italian meat and seafood dishes, such as their ‘secret’ porchetta and foodie favorite eggplant parmigiana. Known as a classic Italian roast, Terrazzo’s porchetta features succulent Iberian pork with various aromatic herbs, making for a great dish to share with friends and family. The eatery’s eggplant parmigiana is another hit, combining symmetrical eggplant slices with a slathering of cheese and San Marzano tomato sauce. Boasting a wide selection of wines to pair with your meal, you can rest assured you’ll find your time at Terrazza’s to be one of a kind. See listing for Terrazza Italian Restaurant. Located on the third floor of Macau Island’s StarWorld Resort, Feng Wei Ju is considered to be one of the island’s finest dining establishments. Decked out with a gold-themed interior, the two-starred Michelin restaurant offers a wide arrange of seating options, from private rooms to smaller dining areas which are draped with shiny gold chain links to provide a slightly more private atmosphere. The restaurant is by no means large, allowing Chef Chan Chek Keong to ensure consistency and quality in his dishes. While some restaurants prepare certain dishes better than others, the culinary team at Feng Wei Ju makes each plate with a dedication to stunning presentation and flavor. The restaurant’s beef tenderloin with lotus paste and boiled Mandarin fish fillets in chili oil are house specialties and, unquestionably, palate pleasures. Marinated in a blend of Hunanese sauces and spices and slow-cooked for three hours, the beef tenderloin is as juicy and flavorful as you’ll find anywhere. The long bone from which the meat was taken is also presented on the plate, further emphasizing the freshness that Feng Wei Ju strives for. If you’re looking for a dish with bold flavors, the boiled Mandarin fish is a surefire choice, with premium fish fillets immersed in a secret chili oil recipe that includes over 20 different Sichuan sauces and spices. The restaurant is also known for their hand-pulled noodles, which received a special mention in the Michelin Guide 2019 Macau. See listing for Feng Wei Ju. If enjoying some excellent Cantonese dishes strikes your fancy, we know of no better place than Fook Lam Man. Tucked away on the second floor inside Galaxy Macau’s Promenade shops, Fook Lam Moon, which means “good fortune arriving at your door,” is an establishment specializing in traditional Cantonese dishes that welcome food connoisseurs from around the world. The restaurant’s baked abalone puff offers a unique combination of texture and flavor, combining the crispy, flaky puff pastry with the soft and chewy mollusk. Another seafood specialty of this highly esteemed eatery is the baked crab shell stuffed with fresh crab meat and onions, which comes with a delicious fried coating and packed with two different types of crab meat, making for a truly mouthwatering edible. The restaurant offers both open space dining and privates rooms, two of which come with an outdoor balcony. Fook Lam Moon is the perfect place to enjoy a wide range of fine Cantonese delicacies in the City of Dreams. See listing for Fook Lam Moon. While it wouldn’t be fair to say we saved the best for last, 8 ½ Otto e Mezzo BOMBANA is an unparalleled gastronomic experience. From the moment you walk through this fine Italian restaurant’s wooden doors you know you’re in good hands. From the tall and jovial General Manager Leonardo Degl’Innocenti running the show in the dining area, to Executive Chef Antimo Maria Merone furthering Head Chef Umberto Bombana’s vision of perfectly executed culinary delights with his own masterful techniques in the kitchen, this restaurant offers everything a diner could ask for and more. Sommelier Mirco Tarducci is also on hand to take your dining experience to new heights with wine pairings from Italy, France and the rest of the world. This restaurant offers a five-course and seven-course degustation menu as well as a select number of main courses. On our visit, we found the marinated Japanese tuna and ‘Mayura’ signature tenderloin and short ribs to be absolutely incredible. The tuna is brilliantly marinated in a pomelo and tofu emulsion and topped with Kaluga caviar that boasts incredible texture and will send your taste buds to the stratosphere. The ‘Mayura’ tenderloin and short ribs, freshly imported from Australia, are succulent cuts beyond compare, accompanied by a red wine and plum sauce as well as roasted vegetables. Chef Merone’s unique adaptation of Montebianco is also an unforgettable dessert dish, arriving at the table in a spherical shape composed of candied chestnuts with light chestnut ice-cream and hazelnut meringue tucked away inside the delectable ball. 8 ½ Otto e Mezzo BOMBANA provides great eats in a pleasant, dimly-lit space. Accompanied with smooth music and a light level of consistent chatter, you can enjoy a relaxed atmosphere while indulging in this particular restaurant’s creative dishes. See listing for 8 1/2 Otto e Mezzo BOMBANA. Mirco Tarducci breakdowns some of the oddest things he's seen working as a Sommelier. Macau is often considered one of Asia’s best foodie cities and this special limited-time gastronomical event will only help confirm that. The day of reckoning for Guangzhou's chefs and restaurateurs has hit; here are the results. We tested those new Michelin burgers from McDonald's. But were we lovin' it? They've done it again, and by they, we mean McDonald's and the almost-as-famous Michelin Guide.